Today, India is in serious danger of losing her invaluable yogic heritage to fly-by-night yoga teachers, both eastern and western, who offer a random mix of physical postures, aerobics and breathing exercises in the name of yoga to unsuspecting students. Nithya Kriya aims to protect and preserve the original yoga born of centuries of research and development and the inestimable personal contribution of innumerable enlightened yogis who gave their lives to enrich this science. According the teaching methods laid out by legendary yogis like Gorakhnatha and Matsyendranatha, the individual asanas and pranayama techniques are sacred and must not be tampered with, while the combinations of techniques required to produce the desired effect are to be received by the learner form his own personal guru. True to the Vedic culture, these fathers of modern yoga left the door wide open for continuous updating of this ancient science. Nithya Kriya is soundly anchored in the sacred yoga scriptures, incuding the legendary Patanjali Yoga Sutras, as well as the three classic texts that form the base of yoga - Hatha Yoga Pradipika,Gheranda Samhita and Shiva Samhita. Patanjali Yoga Sutras is the foundational text of yoga, written by the father of yoga, the enlightened sage Patanjali. This esoteric yet highly practical text, based on Saankhya Yoga, is said to date back to the 2nd century BC, although it is believed to be far more ancient. Patanjali Yoga Sutras emphasise the value of yoga as a lifestyle, through ashtanga yoga (8-limbed yoga) consisting of yama & niyama(personal and social disciplines), asana (postures), pranayama (controlled breathing), pratyahara (sense and mind control), dhaarana (concentration), dhyaana (contemplation) and Samadhi (non-dualistic consciousness). Hatha Yoga Pradipika is a 15th century Sanskrit hatha yoga text, written by Svami Svatmarama, a disciple of Swami Gorakhnatha. The book is dedicated to Adinatha or Lord Shiva, who is said to have revealed the secrets of hatha yoga to his divine consort Devi Parvati. Hatha Yoga Pradipika contains four major upadeshaas (teachings) which reveal the correct understanding and practice of asanas, pranayama, chakras, bandhas, kriyas, shakti, nadis, mudras and kundalini. Gheranda Samhita is a highly practical and effective yoga manual said to have been taught by the sage Gheranda to Chanda Kapali. Gheranda Sahmita advocates a sevenfold yoga, including shatkarma(cleansing processes), asana (postures), pranayama (controlled breathing), mudra (finger locks), pratyahara (mind control), dhyana (meditaion) and samadhi (the fruit of all the above). Shiva Samhita is a complex text that spans the entire spectrum of human experience, from health to liberation. Starting with a treatise on spiritual liberation, this text goes on to reveal 84 beneficialasanas, pranayama, meditation and visualization techniques, mantras, subtle energy channels (nadis), kundalini and the importance of the guru on the path. The other texts that Nithya Kriya draws from include the Kumbhaka Paddhati of Raghuvira, Trisikhibrahmanopanishad, Yogakundalayupanishad, Yogachudamanyupanishad and Yoga Taravali, among others. Although human nature remains essential the same across the ages, the human body and mind is hardly what it was when the foundational texts of yoga were written, some of them over twenty centuries ago. Seemingly extraneous factors like workplace stress, a hurried lifestyle and changing social realities are having a real and profound influence over even such basic processes as the way our cells function or our brain processes information. Therefore, any technique that has to work for today’s individual has to be evolved for and tested on the kind of body-mind that it aims to benefit. The evolution of Nithya Kriya follows a threefold process: 1) Every single technique evolved as part of Nithya Kriya is compiled and personally tested by Paramahamsa Nithyananda, who brings to the scriptural wisdom his own unique understanding of the complex equations of body, breath and mind in the modern individual 2) Once the technique has been perfected, it is tested on a select group of disciples over a period of one mandala (21 days), and feedback is received which is then incorporated in the kriya. Through the process of parallel testing, several kriyas are tested on different groups over the same period. For healing kriyas for particular ailments, testing is done on people who suffer from that ailment, as well as a control group. 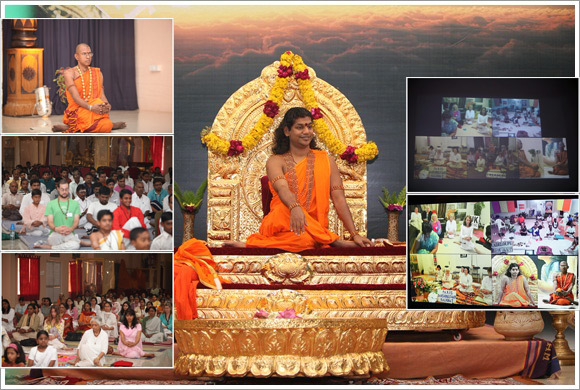 3) Once the kriya has been sufficiently tested, it is released to a group of 1000-2000 followers and yoga practitioners from diverse cultures and age groups around the world who undertake to voluntarily practice the kriya under the direct guidance of Paramahamsa Nithyananda, either in His physical presence, or through two-way video conferencing. Individuals suffering from a particular disease practice the kriya for a period of one mandala (21 days) and revert with feedback. The requisite changes are made and the modified version is further tested. 4) For each ailment, both ‘care’ and ‘cure’ kriyas are designed. For instance, the Kriya for Hypertension Care is a preventive kriya for healthy individuals, while the Kriya for Hypertension Cure is aimed at benefiting individuals who already suffer from hypertension. In this way, each Nithya Kriya goes through several cycles of stringent testing before it takes its final form. Even so, in keeping with the Vedic practice of continuous learning and enrichment, feedback is invited from anyone who can contribute positively to the evolution of Nithya Kriya as a holistic solution for body, mind and spirit for the modern individual. While extolling the benefits of disciplined practice, yoga texts do not hesitate to declare that the results equivalent to 12 years of strenuous sadhana (spiritual disciplines) can be granted by the guru in a moment to a disciple who is open to it. While theoretically, the entire kriya may be assembled and taught by anybody with sufficient knowledge of the yoga scriptures, the benefits of practicing the same kriya in the presence of a highly evolved being are simply inestimable. This is especially so when participants are literally ‘opened’ to the technique by the highly revered process of deeksha or initiation by the Master. The highly scientific yet mystical experience of deeksha can be explained to some extent by the principle of resonance. Just as a bowl of water will begin to hum when struck with a metal rod at the right frequency, an energy adept can subtly force the practioner’s energy into higher spiritual frequencies by the sheer pressure of his own positive vibration. At such moments, the body and mind lose their natural resistance and awaken to their own highest possibility of health and wellbeing. A significant distinction of Nithya Kriya is the safe and scientific awakening of the Kundalini energy in the practioner. Kundalini is the tremendous potential energy that lies latent in each of us. Kundalini can be described as every individual’s hotline to the infinite Cosmic energy. 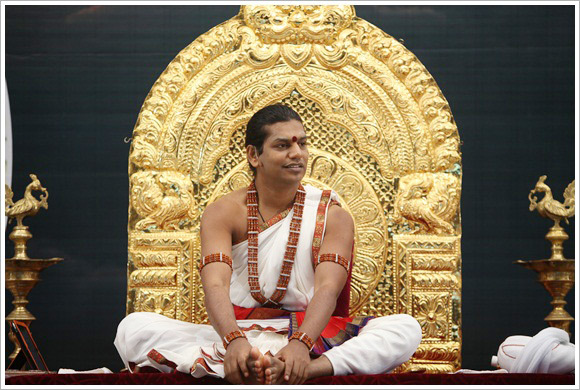 Once awakened by appropriate yogic practices and the guidance and grace of the guru, Kundalini showers a host of blessings on the practitioner, including a big boost in energy levels, physical well-being, the falling away of negative mental patterns, true inner fulfillment and a deep connection to the universal Source.